On Wednesday, November 30, 2016 the Twins announced the signing of free-agent catcher, Jason Castro to a 3-year, $24.5MM contract, a move that was widely attributed to the Twins’ new front-office comfort with advanced analytics. Jason Castro is widely regarded as very good defensive catcher, due in large part to his ability to frame pitches and steal strikes for his pitchers. In 2016, Castro ranked third in all of baseball in Baseball Prospectus’ Framing Runs statistic, with 16.3. Kurt Suzuki, the Twins primary catcher in 2016, ranked 92nd at -6.8. Suzuki’s main backup, Juan Centeno, ranked 97th with -9.7. Castro is a roughly average offensive catcher. He put together a 88 wRC+ in 2016, which ranked 17th among catchers with at least 250 PAs, via FanGraphs. For reference, the league-average wRC+ for catchers in 2016 was 87. But, he got a $24.5MM contract primarily because of his framing and the Twins are expecting him to make an impact on their pitching staff. Using this list of pitchers, we can utilize FanGraphs’ excellent heatmaps tool to explore each pitcher’s distribution of pitches around the strike zone. 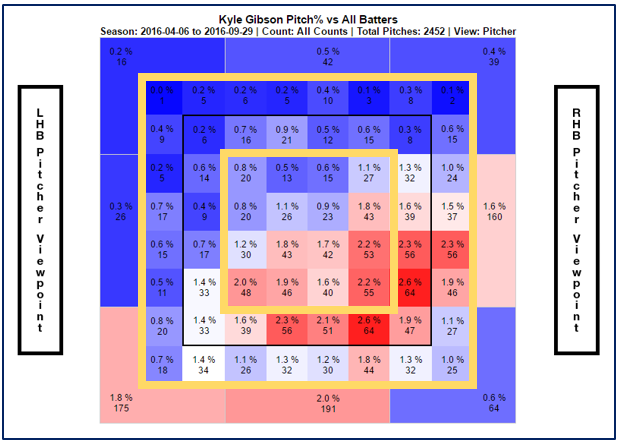 For example, here is Kyle Gibson’s 2016 pitch% heatmap, which displays the percentage of pitches thrown to each particular segment in and around the strike zone (from the pitcher’s perspective). The rulebook-defined strike zone is outlined in black. There are not many surprises here, as we can see Gibson most often pitches down in the zone, and to his arm side, which is likely driven in large part to the high number of 2-seam sinking fastballs he throws (27.2% of total pitches in 2016, per PITCHf/x data available on FanGraphs). What this data also lets us do, is explore each pitcher’s propensity for pitching to the edges of the strike zone. Let’s assume much of the benefit of pitch framing occurs at the edges of the strike zone, where pitches are less definitively a ball or a strike to the eyes of the umpire. By focusing on the edges of the zone we can identify which Twins pitchers might benefit most from better framing. 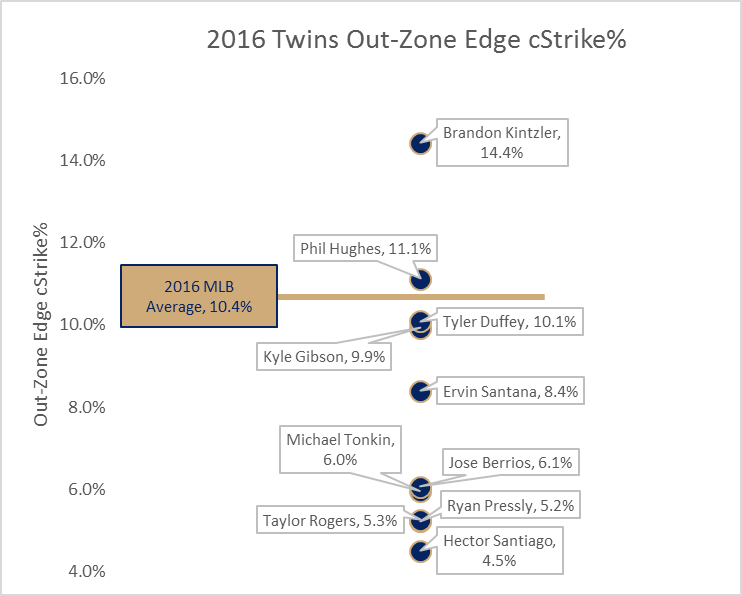 What we can see is the Twins’ starting pitchers seemed to pitch toward the edges of the strike zone more than the league average and more than their reliever teammates in 2016, with the exception of Brandon Kintzler. Ervin Santana is approximately at league average, which was 44.7%. Kyle Gibson is significantly above, at almost 49%. Jose Berrios, Phil Hughes, and Hector Santiago are all up around 47%. So, as a starting point, we can assert that Gibson, Berrios, Hughes, and Santiago are the primary candidates to benefit from better framing. But how do they fare in getting called strikes around the edges of the zone? As we would expect, pitches located in the middle of the zone are nearly always called a strike, evidenced by the bright red boxes and rates at or near 100%. Our interest is just on and just off the edge of the strike zone, which I again outline in gold. 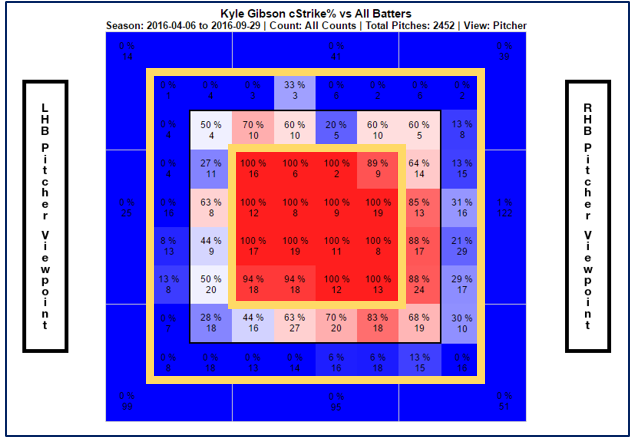 Here, we see more variation, with the called strike percentage ranging from as high as 88% in the zone to Gibson’s arm side, to as low as 27% inside the zone up and to his glove side. We also see, pitches just off the strike zone are called strikes at a much lower percentage than pitches just in the zone, as you would expect. We need a reference point. How do the Twins compare against the rest of baseball? Using this data, I calculated two additional metrics, In-Zone Edge cStrike% and Out-Zone Edge cStrike%, which delineate the called strike percentage on the edge and in the zone, and on the edge and out of the zone. 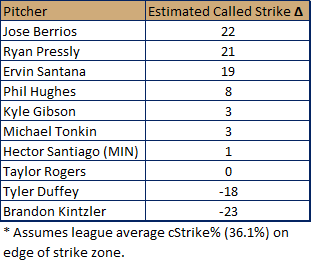 Focusing on these strike zone segments, I calculated the called strike percentage for each Twins pitcher. Also included are the MLB averages for each metric. What we see above is that six of the 10 Twins pitchers to throw 50 innings last season had a lower than league-average called strike rate on pitches on the edge and inside the legal strike zone. Ryan Pressly and Jose Berrios appear to be the most impacted, with called strike rates of significantly less than the league average of 64.9%, at 52.8% and 57.5% respectively. But what about just off the edge? When we focus on the segments just off the strike zone, we see this same trend play out, but even more significantly. The visual above shows that eight of the 10 Twins hurlers had lower than league-average called strike rates on pitches just off the strike zone. This indicates that they were not getting many strikes stolen in their favor. In most cases for the Twins, the difference from league average is quite significant. 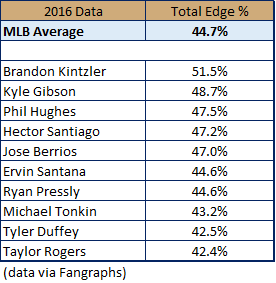 Berrios, Michael Tonkin, Pressly, Taylor Rogers, and Santiago each have rates right around half the league average of 10.4%. 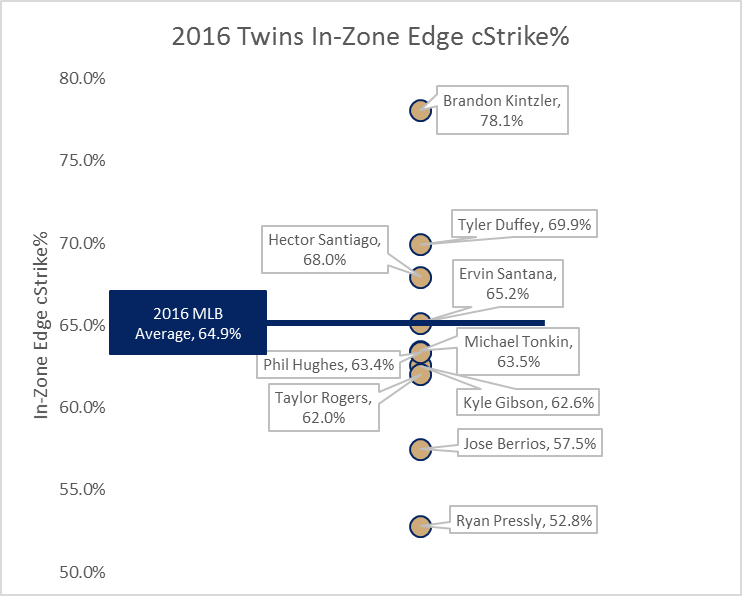 The net result, when we add up the In-Zone and Out-Zone Edge cStrike% for Total Edge cStrike%, is that seven of the 10 Twins pitchers studied had called strikes rates around the edges of the strike zone that were decidedly less than league average. Now, this probably isn’t all that surprising intuitively. We know the Twins as a whole did not pitch well last year (29th in ERA, 27th in FIP, per FanGraphs), and we know the Twins catchers did not rate well as pitch-framers. Kurt Suzuki and Juan Centeno combined to catch nearly 86% of the Twins’ defensive innings last season. But for as bad as the team pitched, it is also clear the pitchers were not getting much help from their catchers. 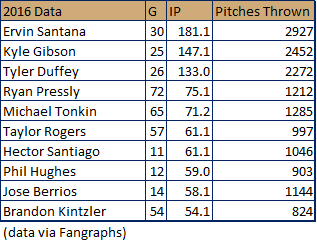 By this analysis, it seems that Jose Berrios, Ryan Pressly, and Ervin Santana would benefit the most from better pitch-framing, with each gaining roughly 20 additional called strikes over the course of the season. But how much does a pitch being called a ball, instead of a strike, matter? By this measure, the value of a strike, depending on the count is quite significant. 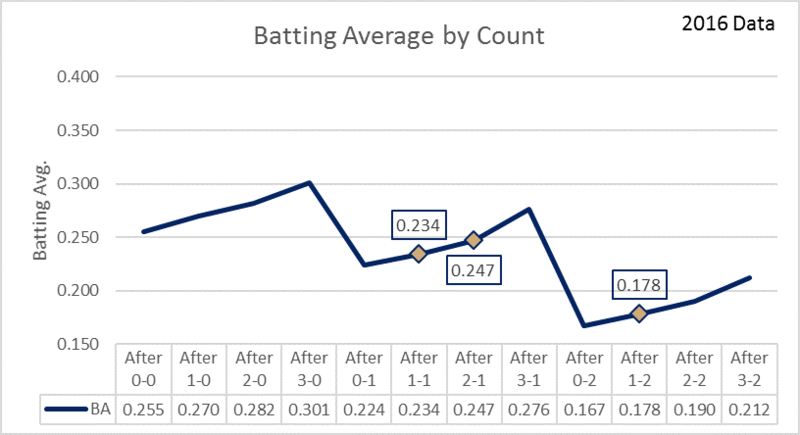 In a 1-1 count, for example, if the next pitch is called a strike, making the count 1-2, the batter’s expected batting average drops from .319 to .164. Similarly, if the pitch is a ball, making the count 2-1, the batter’s expected average increases to .327. That’s a .163 swing in expected batting average. While the differences here are not quite as steep as before, we still see the swings matter. Batting average after a 1-2 count is .178, where after a 2-1 count it is .247. That’s still a .069 swing in batting average. 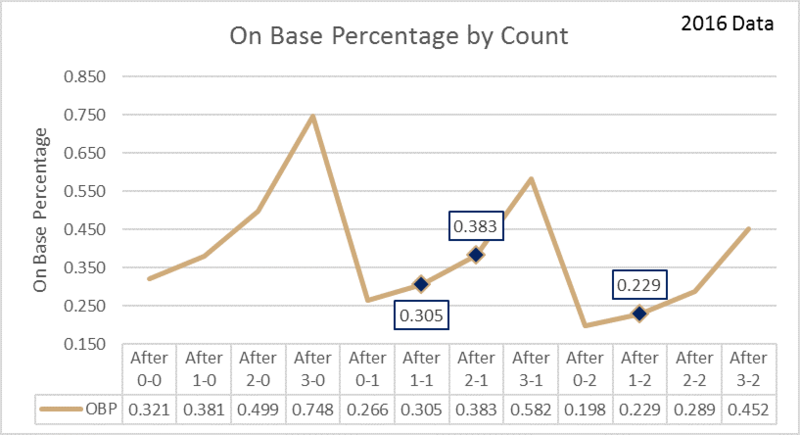 We also have added on-base percentage, and the trend holds. OBP after a 2-1 count in 2016 was .383, versus just .229 after a 1-2 count. So, all of this helps us show the Twins have a pitch-framing problem and pitch-framing matters because getting more pitches called strikes leads to fewer runners on base. But can Jason Castro fix it? 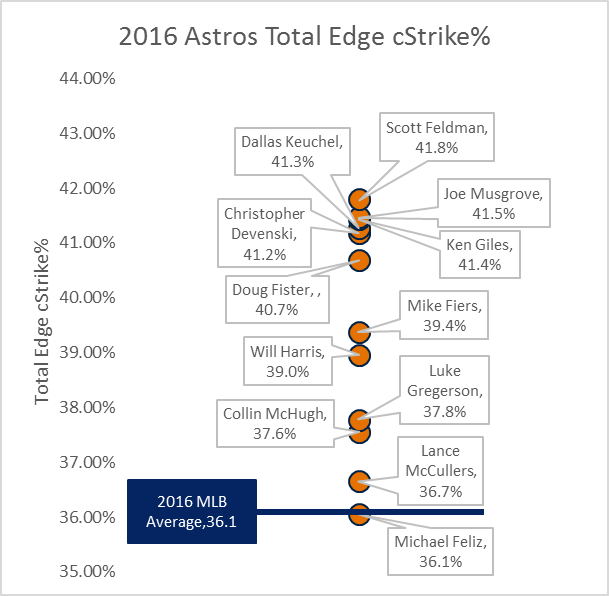 Of the 12 Astros to throw more than 50 IP, only one, Michael Feliz, had a lower than league-average called strike rate on the edge. But even he was roughly league average at 36.06%, compared to league average of 36.11%. 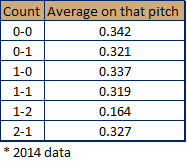 The rest of the pitchers studied were above league average, and in most cases, quite comfortably so. Six of them are clustered close together right around 41.0%. Now, to be fair, not all of this is directly attributable to Castro. These are different, and arguably, better pitchers. And Castro didn’t catch every pitch thrown (he caught 61.9% of the Astros’ defensive innings in 2016). But, the difference is stark and by this rough measure, it seems Jason Castro will make a positive impact for the Twins pitchers. To the Twins’ credit, they recognized they had a weakness, and they used the free-agent market to acquire a player they hope can help address it. We hoped you liked reading Pitch-Framing and Twins Pitchers by John Foley! What Happened to Adam Wainwright? Albuquerque based Twins fan. Former college pitcher. Graduate of Evansville, Illinois, and Notre Dame. Strategy consultant by day. Interested in making better decisions through data and analysis. well written. concise and to the point. PM and I discussed this very subject the morning of the 16-inning vs Strasburg/Nats. Twinkies signed up 2 of MLB’s 5 most valuable assets.